For the hunter on a budget, these cartridges are an excellent tool to aid in filling the freezer with tasty venison. 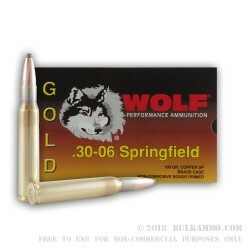 Each .30-06 round from Wolf's "Gold" brand uses precise machinery, traditional load recipes, and multiple quality control checks. Components for this load include reloadable brass casings, clean-burning powder, and non-corrosive Boxer primers which will all be less harsh on your favorite hunting rifle over time; in addition, the heat-treated casings provide consistent chamber pressures and are safer for multiple reloading repetitions. Wolf tops off the cartridge with a 180-grain bullet which sits at the median of the caliber's range for a balance between flat trajectory and terminal effect on a game target. This .30-06 Springfield projectile has a copper jacket with an exposed lead tip, making it a soft point bullet that is ideal for taking down deer and similarly sized animals. As the round penetrates into a target its soft nose will flare outwardly under pressure, causing a good degree of expansion that will produce faster bleeding, transfer greater energy to vital areas, and reduce the chance of both run-offs and errant over-penetration. As a result, hunters can drop deer with humane speed while maintaining a balanced weight to their wallets as well. Wolf is an American company that uses their relations with other countries to import inexpensive ammunition for a wide range of shooting purposes. Their analysis of user feedback has caused them to tweak their demands and make sure that incoming ammo is best suited for U.S. shooters and their firearms of choice.